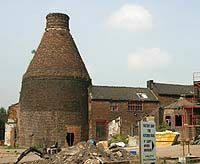 Potteries Heritage Society, working with the City Council, secured grants from the Heritage Lottery and Staffordshire Environmental Funds totalling more than £600,000 to help repair 10 of the remaining bottle ovens considered to be most at risk. The project included the establishment of a Buildings Preservation Trust, which leased the structures from their owners and attended to their ongoing maintenance. Our Lottery success has proved that we can make a difference to the way our heritage is regarded. More and more agencies are beginning to realise the value of effective partnerships between community groups and the public and private sectors. There has never been a better time to get involved.